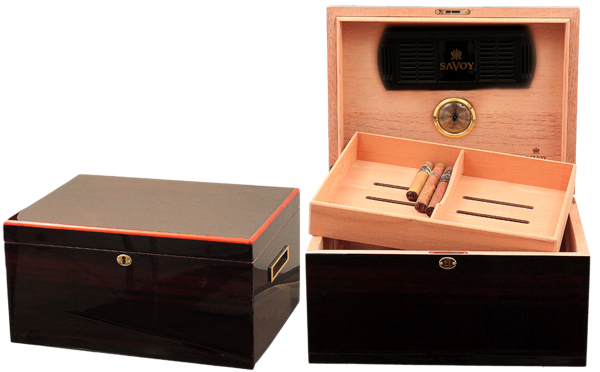 Featuring built-in locks, as well as twin humidifiers (necessitated by the greater volume) and hygrometers magnetically mounted to the inside of the lid, Savoy's extra-large humidors offer half-again the capacity of the large size, a full 150 cigars. To help keep such numbers organized, it includes an upper-level tray, and removable dividers for both the tray and the bottom section of the humidor. Construction is of solid, tightly-joined cedar, with brass hardware and highly polished, genuine veneer exteriors. This model is the Macassar, paneled in the Macassar species of variegated ebony; a rich, smokey, very dark, and rather hard to find wood highly prized for its decorative qualities.